Baking with frozen bread dough has made life so much easier for those who do not enjoy working with yeast. Everyone loves the smell and taste of freshly baked yeast bread. As true as this is there are also many people who simply refuse to deal with making yeast breads. They think it is just too time consuming, especially the rising of the dough and sometimes several times. There have been many times when my children were young that I chose baking with frozen bread dough. At holiday times, I would spend most of my time focusing on preparing the main meal of the day. This would include pastries, breads, desserts as well as the main entrees all from scratch. I still wanted my family to have something special for breakfast also for these holidays. This is how I started leaning on the frozen bread dough for special times. When I first started baking with frozen bread dough, I never realized how many wonderful delicious recipes I would come up with. 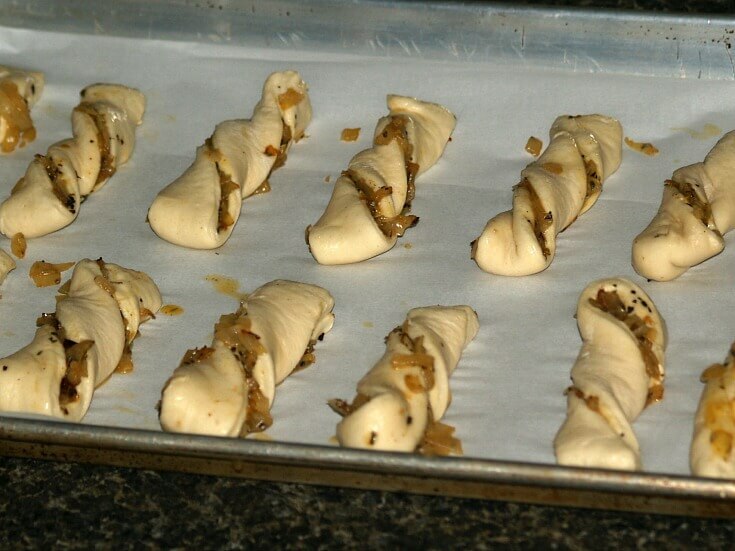 The first recipe and the one I have used the most is for pecan rolls. For many years these were a staple for Christmas breakfast and often for other holiday breakfasts. 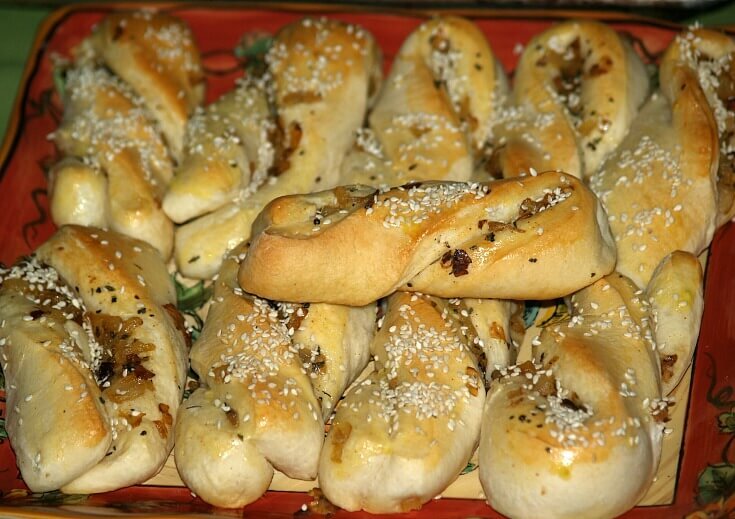 By baking with frozen bread dough you can create this olive bread. Roll out dough on floured surface into a 10 inch circle. Sprinkle circle with olives, cheese and pepper. Fold dough over and knead until well incorporated into dough. Shape into a 6 inch oval tapering ends slightly; place on prepared cookie sheet. Cover with plastic and let rise in a warm place 45 to 60 minutes until double. Mix egg white and water together; brush loaf. Decorate top by cutting a 5 inch square of wax paper with designs. Spray 1 side of wax paper with non stick spray; place sprayed side down on loaf. Sift flour over the holes leaving a design on the bread. Bake about 30 minutes until golden brown and loaf sounds hollow when tapped with fingers. By baking with frozen bread dough you can make this fabulous brie bread! Grease outside of 9 inch can pan; place pan in center of greased baking tray. 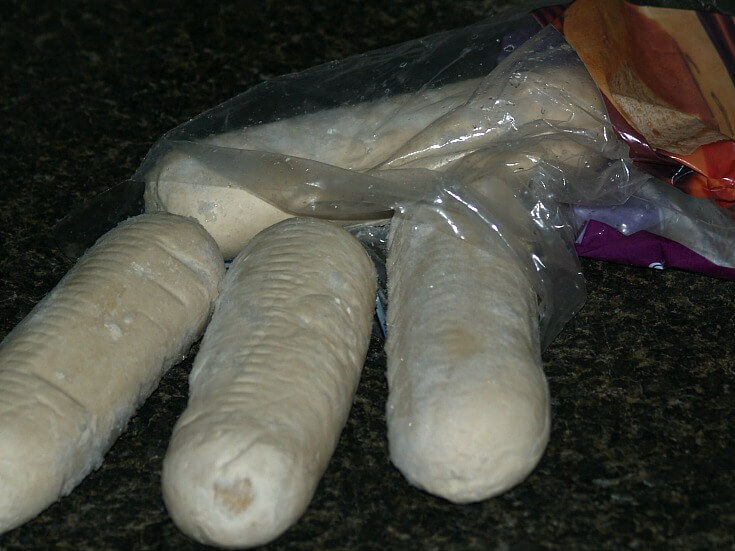 Divide bread dough into thirds; roll each part into a 36 inch long rope. Braid 3 ropes together; wrap around cake pan on prepared tray pinching ends to seal. Cover and let rise in a warm place until double in bulk about 1 hour. Bake 18 to 20 minutes until golden brown; remove from oven and cool. Place almonds and sesame seeds in a shallow pan. Bake at 350F degrees for 5 to 10 minutes until toasted stirring occasionally. Trim rind from top of Brie; brush preserves over the top. Arrange almonds, sesame seeds, cranberries and pineapple over the preserves. Place the Brie in the center of the bread braid; 20 servings. By baking with frozen bread dough you can make these cinnamon rolls very fast. Roll dough to a rectangle (16X14 inches) on a floured surface. Spread dough with the melted butter. Combine cinnamon and sugar in a small bowl; sprinkle over the butter. Starting at long end roll dough up jellyroll fashion. Cut dough into 10 slices; place in greased muffin cups. Let rise 1 ½ to 2 hours at room temperature until doubled in bulk. Bake rolls about 15 minutes; remove from oven and let cool 5 minutes. MIX POWDERED SUGAR and water to a smooth consistency. 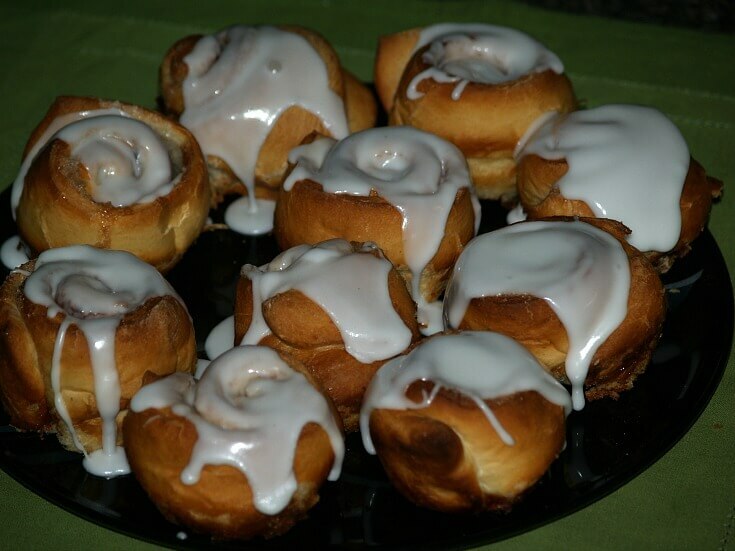 Spread icing over warm rolls and serve; makes 10. By baking with frozen bread dough you can make this easy pepperoni and cheese appetizer or snack. Oil hands slightly; spread dough in ungreased shallow jelly roll pan (12X17 inches); set aside. Beat eggs; mix in the pepperoni and cheese and spread over the dough. 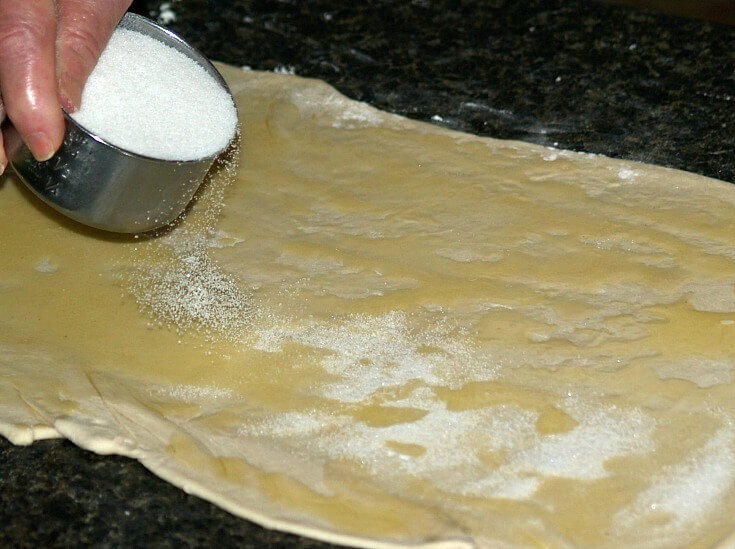 Roll up the dough beginning at the long side like a jelly roll; place seam side down on pan. Bake for 30 to 35 minutes until bubbly and bread is brown; slice while warm and serve. NOTE: Can be baked ahead, wrapped in foil, frozen and reheated. By baking with frozen bread dough you can make these fabulous dinner rolls. Melt butter in medium skillet over medium heat until foamy. Add onions and paprika; cook until onions are tender stirring occasionally. Remove skillet from heat; spray work surface with nonstick cooking spray. Roll bread dough into a rectangle (14X12 inches). Spread ONE SIDE of dough rectangle with onion mixture (Making 14X6 rectangle). Fold plain half of dough over the onion mixture (Pinch 14 inch side to seal). Cut into 14 strips each 6X1 inches; gently twist each strip 2 times. 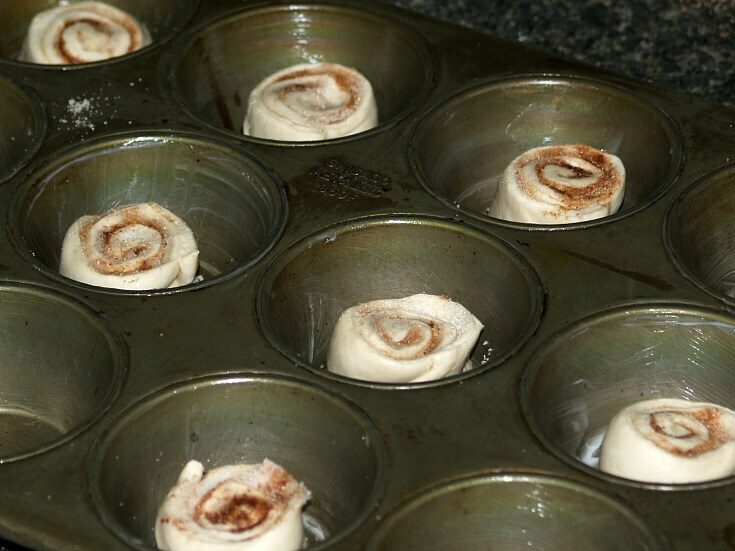 Place twists on prepared baking sheet; press both ends of twist down on baking sheet. Cover with towel; let rise in a warm place about 40 minutes or until doubled. Brush with egg; sprinkle with sesame seeds. Bake 15 to 18 minutes; serve immediately. By baking with frozen bread dough you can make festive breads for the holidays. TO MAKE STAR PATTERN draw 8 inch circle on parchment paper. Cut a star shape filling the entire circle; cut out the star pattern. Roll dough out on lightly floured surface into a circle (8 inches) in diameter. PREHEAT OVEN TO 350F degrees; grease cookie sheet and set aside. Spread a couple drops of milk on the back of the pattern. 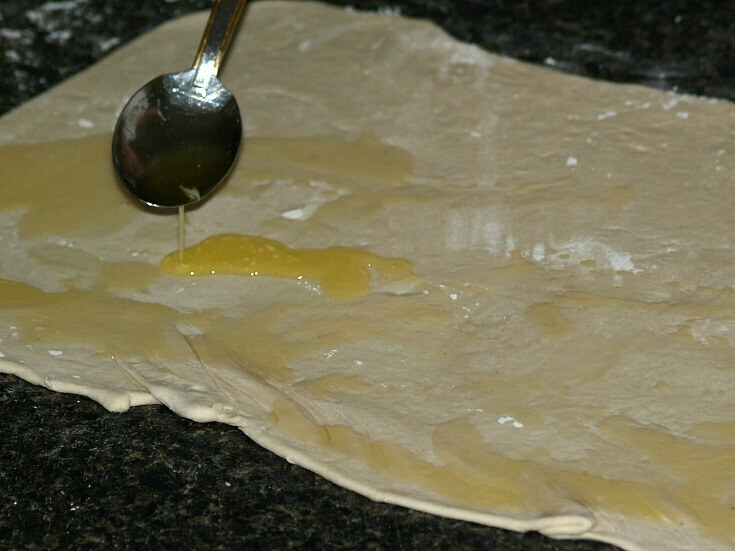 Place moistened side of pattern down on the rolled dough. Cut dough around the star with shears or a knife. Place star shaped dough on cookie sheet; gently remove paper. NOTE: Pat down or correct shaping if needed. Brush dough with beaten egg; let rise about 1 hour. Bake about 25 minutes or until golden brown; decorate as desired. Serve with honey spread (Below). TO MAKE HONEY SPREAD beat ¼ cup softened butter and ¼ cup honey in a small bowl. Stir in a pinch of nutmeg. By baking with frozen bread dough you can make tasty treats like these balloon buns. Combine and mix the sugar and cinnamon in a small bowl. Divide bread dough into 12 equal parts; roll each part into a 4 inch circle. Dip each marshmallow into the melted butter; roll into the cinnamon sugar mixture. Wrap circle of dough around each marshmallow; pinch dough together at the bottom. Dip again in the melted butter; roll again in the cinnamon sugar mixture. Place pinch side down in prepared muffin cups; cover and let rise until doubled 30 to 40 minutes. PREHEAT OVEN 375F degrees; bake 25 to 30 minutes until golden brown. Immediately remove from pan; cool slightly and serve warm. If you are baking with frozen bread dough you can easily make these cute mitten beef sandwiches. Divide dough into 8 parts; tint 2 PARTS with red food coloring. Divide the RED PARTS into 3 PARTS (Making 6 parts). Roll each of the 6 red parts into 3 inch ropes; set aside. For each mitten flatten each white part into a 4 inch OVAL; place on greased baking sheet. With shears cut a 1 ½ inch diagonal cut into side of oval toward center for the THUMB. Tuck tip under to form a rounded thumb; spread thumb apart from mitten. Place a red rope at top of mitten for a cuff; pinch edges together and flatten slightly. Beat egg and water together; brush over the mittens. Bake for 15 to 20 minutes until golden brown; cool on wire rack. NOTE: No need to rise. Shred beef with a fork; place in saucepan; add barbeque sauce, brown sugar, ketchup and jelly. Split mitten buns in half; fill with the beef mixture and serve. Roll out dough on a lightly floured surface to form 15X7 inch rectangle. In a small bowl combine brown sugar and cinnamon; set aside. 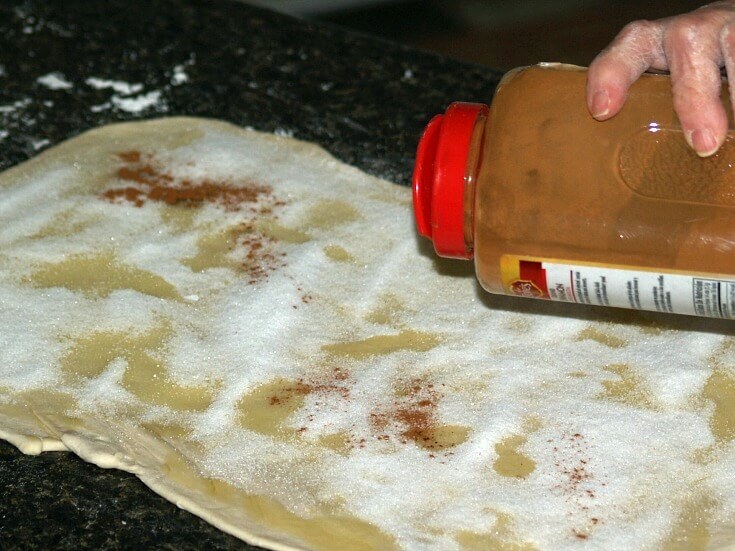 Spread the butter over the dough; sprinkle the cinnamon sugar mixture evenly over the butter. NOTE: I love pecans! IF DESIRED sprinkle with chopped pecans. Starting with long side roll dough up like a jelly roll. Cut roll into 16 slices; place slices in TWO round buttered baking pans. Set pans in warm place and allow to rise until doubled in bulk about 60 minutes. Bake 15 to 20 minutes until golden on top. 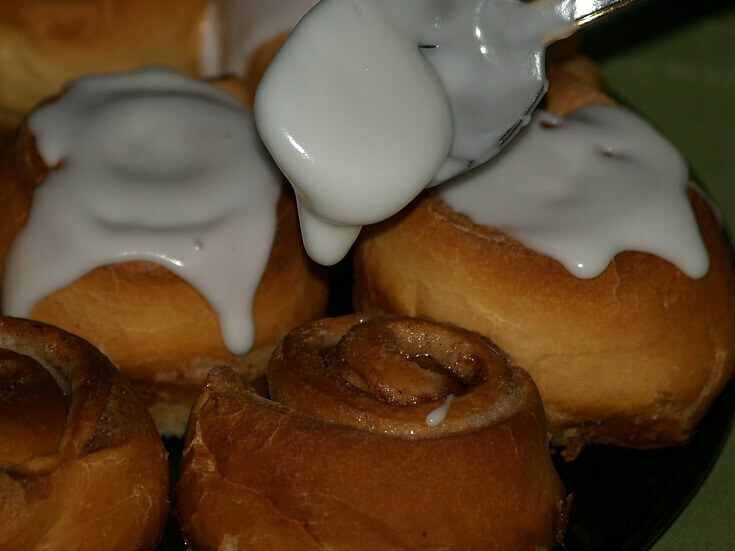 TO MAKE FROSTING beat icing ingredients until fluffy; spread over warm rolls and serve warm. By baking with frozen bread dough you can make quick entree recipes like this calzone recipe. Divide 1 pound bread dough in half; roll each half into a large circle like pizza crust. Brush each circle of dough with half of the melted butter (Omit butter on outer edge of circle). Sprinkle each with 1 teaspoon garlic powder, 1 teaspoon dried basil and 1/3 cup of Parmesan cheese. Place slices of Provolone cheese on half of each circle. If desired place meat over the cheese. Wet with a little water the outer ring of dough with no butter. Fold the half circle (Without cheese) over the provolone cheese; pinch edges to seal. Place on baking sheet and brush lightly with olive oil; bake about 20 minutes. NOTE: Cover with foil if calzones begin to brown too much.